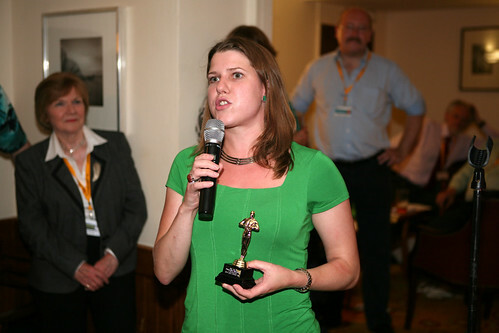 The Liberal Democrat Blog of the Year awards (sometimes abbreviated to the BOTYs) have taken place annually at the party’s Federal Conference since 2006. It’s time to cast your votes (by STV) in the category for Best non-Lib Dem politics blog in the Lib Dem Voice Blog of the Year Awards 2012. Simply use the app below and vote by 5:30 tomorrow. The results will be announced at the BOTYs ceremony at Conference tomorrow night (10pm, Pavilion Room at the Grand Hotel, Brighton) and will appear online shortly afterwards. Follow the ceremony on Twitter using the hashtag #LDBOTY. Nominations for the Liberal Democrats’ Blog of the Year Awards 2011 closed on 2 September. Since then, the judges Helen Duffett (that’s me), Richard Flowers, Olly Grender, Katie Razzall, Stephen Tall and Martin Tod have been poring over the entries for the six categories. Next, a plug for the awards ceremony itself. If you’re coming to party conference in Birmingham, do come along to the Andante Suite, Hyatt Regency Hotel, Birmingham, from 9.45pm on Saturday 17th September. Have you nominated your Lib Dem Blog of the Year? Time’s ticking till close of nominations for the Lib Dem Blog of the Year Awards 2011, so here’s a reminder of the categories and an exhortation to vote! As announced last week, it’s time to nominate your favourite bloggers, campaigners and social networkers in the BOTYs – the sixth annual Lib Dem Blog of the Year Awards. It’s time to start thinking about Conference again; at Lib Dem Voice we’re already putting together an exciting fringe programme for Birmingham, including the famous Lib Dem Blog of the Year Awards. More details to follow soon, but meanwhile, make sure you register early for the best rates and a hassle-free application process. Registration for Autumn Conference is now open. If you haven’t already booked your place, we’re offering fantastic early bird rates until Friday 10 June. Click here to register and for further details on prices and deadlines. LibDemVoice are hosting four events at conference – fuller details are available here. The first of these falls tonight, at the Blog of the Year Awards. Nominations for the Liberal Democrats’ Blog of the Year Awards 2010 closed on 27 August. Since then, the judges Prateek Buch, Jonathan Calder, Lee Chalmers, Ryan Cullen, Helen Duffett (that’s me), Costigan Quist, Mary Reid, Jo Swinson and Andy Williamson have been poring over the entries for the six categories. Next, a plug for the awards ceremony itself. If you’re coming to party conference in Liverpool, do come along to Grace Suite 1 at the Hilton Liverpool from 9.45pm on Saturday 18th September. Just a short, teaser post to let you know that the shortlists for the Liberal Democrat Blog of the Year awards 2010 will be published this afternoon at 1pm. Time’s ticking till close of nominations for the Lib Dem Blog of the Year Awards, so here’s a reminder of the categories and an exhortation to vote early! The Leadership Centre for local government has launched a new website: The councillors’ guide to social media. The site has a variety of information for councillors, and is particularly accessible for those who haven’t yet tried this way of communicating. Top ten councillors on Twitter which features four Liberal Democrats (including Lib Dem Voice editors Sara Bedford and Alex Foster). Opportunities not taken is particularly interesting, as it highlights areas for improvement. It says that councillors and officers tend to face cultural, rather than technical barriers to using social media. Some councils still lack a clear social media policy for councillors or officers, either in a personal or professional capacity. Many councils routinely block access to social networking sites on their computers. The guide suggests ways for councillors to hold their councils to account over their social media approach. Connected councillors – a guide to using social media to support local leadership – is available as an interactive version and also downloadable as a pdf. Yes, folks, this is a short, teaser post to let you know that the shortlists for this year’s Liberal Democrat Blog of the Year awards 2009 will be published this morning at 11.25 am. The Lib Dem blog awards are with us again – and one of the categories is ‘Best posting on a Liberal Democrat blog (since 1st September 2008)’. This is actually my favourite award for the simple reason that it recognises writing talent, pure and simple. By which I don’t mean that the prose has to be worthy of a Booker nomination; rather that the article has to attract, engage and provoke readers – elevate our thinking, if you like. The Liberal Democrat Blog of the Year Awards, run in conjunction with Lib Dem Voice, are back for their fourth year. As usual, they’ll be awarded in a budget lavish ceremony at the party’s autumn conference in Bournemouth. (There’s further information on the event over at the Lib Dems’ Flock Together site). Click on the following links to see last year’s Shortlist and the Winners. Thank you to everyone who emailed in nominations for this year’s Liberal Democrat Blog of the Year awards. The judges (Kate Bevan, Rob Blackie, Ryan Cullen, Lynne Featherstone, James Graham, me, Sunny Hundal, Mark Pack and Stephen Tall) have pored over around 80 nominated blogs to whittle them down to the shortlists below. The shortlists do, of course, represent the subjective opinions of the judges, so congratulations if you’ve been shortlisted but don’t worry if you haven’t – as always, the standards were high and there were tough decisions to make. The awards are a bit of fun that we hope will highlight some of the best examples of Liberal Democrat blogging and introduce you to some blogs you might not have read before. I know you’re on tenterhooks, but assuming you haven’t skipped this bit already I have three announcements before we proceed. The first is a reminder that the winner of the Best non-Liberal Democrat politics blog category will be decided by a public vote here on Liberal Democrat Voice, so please have a read of the nominated blogs and then head on over to the sidebar or to the bottom of this post to cast your vote. Secondly, a plug for the awards ceremony itself. If you’re coming to party conference in Bournemouth, do head along to Old Harry’s Bar in the Marriott Highcliff Hotel from 9.45pm on Saturday. They’ll be refreshments on arrival (thanks to soon-to-be-announced sponsors), so come early! Finally, I’m very pleased to announce that, with the kind agreement of Tim’s widow, Baroness Garden, the award for the best blog by a Liberal Democrat holding public office will from now on be known as The Tim Garden Award, in honour of Lord Garden, a blogger for many years, who died last year. Without further ado, here are the shortlists.